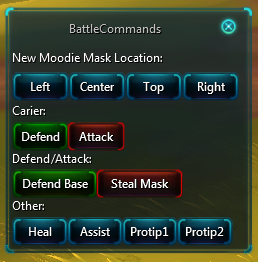 Battle Commands is a tool for BG leaders allowing them to post simple commands on chat channel. I would love to make it simmilar to Smite voice commands as much as possible, excluding voiceovers, but it may not be posible. Use /bgc to bring Battle Commands window. Press button to post command on chat channel (Instance channel only atm). Left - "New Moodie Mask on Bottom LEFT Spot!" Center - "New Moodie Mask on Bottom CENTER!" Top - "New Moodie Mask on BRIDGE!" Right - "New Moodie Mask on Bottom RIGHT Spot!" Defend - "Defend Our Mask Carier!" Attack - "Attack Enemy Mask Carier!" Protip1 - "Remember: Objectives > Kills!" Protip2 - "Remember: If there isn't a mask close by and you're fighting you probably doing something wrong." Above List is pretty short and probably lacking some additional mesages, feel free to post messages you want to be added in comments. Any other sugestions are also welcome. Option for user to select which chat channel he would like to use. Option for user to add own commands.